When a ghost town is destroyed via quantum means, physicist Madison Martin is called in, but she's mystified. The weirdness intensifies when a ghost starts following her around. Things get more serious when a young man is murdered and an old quantum nemesis is back from the dead. Madison resumes her role as the quantum cop to help the cops and the FBI investigate increasingly bizarre crimes including disappearing clothing and a demolished highway. Just as quantum mayhem spreads throughout the world and the global cell phone network is wrecked, Madison discovers her quantum power may be more dangerous than she ever suspected. Can she reverse the quantum mayhem? And if so, can she survive? I was given a free review copy audiobook at my request by the author and have voluntarily left this review. Well, somehow, I ended up skipping book 2 and going right into book 3. I didn't feel like I missed too much, so no worries there. As for this book, I enjoyed it as much as I did book 1. It has a fun feel to it and I enjoyed it. I thought the narration is done well. She sounds really young to me, so didn't get the tough cop feel, but it didn't kill things for me. All in all, I liked it and think other sci fi fans would too. This story was fun to listen to, but it seemed like a place holder in the series. If you haven't read the first two books in the series you'll be OK, the writer does a good job of re-explaining the basic concepts of the story line. I was enjoying the twists and turns but suddenly the book was just over. It ends kind of cliff hanger-ish, but not really since the "cliff hanger" is just a feeling by the main character. Large topics in the story were never really explained. I liked the story but not the end of the book. 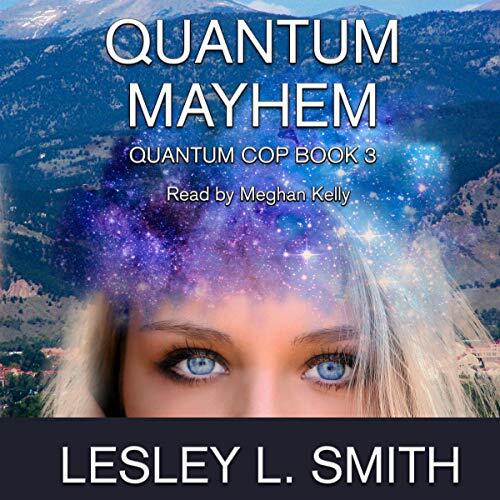 Quantum Mayhem by Lesley L. Smith is book three in The Quantum Cop series. I was given the opportunity to read/listen to this book even though I had not read the first two. Of course starting in the middle of a series is always troublesome. However, Lesley did such an excellent job explaining as she went that I did not feel that it was a problem while reading this one. There were lots of references to earlier events but the explanations made this story work without having been there. I did hear enough to make me want to listen to the first two just to find out how all this began. Overall I really enjoyed this story. The characters, although sometimes stereotypical, fit their roles. Megan Kelly did an excellent job narrating this story. I hope she did the first two as well. Heroine is Madison. She’s a police women . Madison moves using quantum which is great because I understand the concept . My metaphysical headache was getting bigger. Physicist and college lecturer, Madison Martin, also known as the Quantum Cop, has discovered a way to manipulate space, a technique she calls Qlapsing, and has taught the technique to a number of her students. Amongst other things, it enables people to travel instantly from one place to another - a sort of beam-me-up-Scottie without any special machinery required, though it does take a bit of a toll on personal energy. When a small ghost town goes missing leaving just 'a whole bunch of these piles of sawdust', Madison is called in by the local police to find out who could have done it and why destroy a ghost town anyway? Don't worry: no scientific knowledge is needed to enjoy this book although some attempt is made to explain the process. Rather, it is a science fiction cozy detective story with amusing incidents and some reasonably colourful characters. It can be read as a stand alone, though it is probably best taken in context - number three in the series - to introduce the protagonists and avoid confusions. Narrator Meghan Kelly has a pleasant rather little girlie voice which felt very appropriate for the character. She reads clearly and well with good intonation, and her individual character voices were nicely done. Her performance enhances the story. I found this book to be a fun read, and, although I am not sure that I would want to continue with the series, I am tempted to go back to the first books, which I have not read, to find out how it all started. My thanks to the rights holder of Quantum Mayhem, who,at my request, freely gifted me with a complimentary copy, via Audiobook Boom. This is a story which could well appeal to young adults.